the romans come to colchester, "britain's oldest recorded town"
The Romans quite easily gained control of much of what we now call England, including this part in the south-east. The British of this area belonged to the tribe known as the Trinovantes. At the time they were the dominant tribe in Britain. Claudius himself stayed only a very short time in Colchester, and indeed quickly left our shores altogether, to return to more central parts of his Empire. He left his army behind, garrisoned where the present town is centred. For some years it was the (first) Roman capital of the province of Britannia. Soon they built here a fine Temple to the Emperor, who was (unusually) given divine status in his lifetime. When the legion moved away, a Colony of retired soldiers was settled here: they called the town Colonia Vitricensis, the Colony of Victory. But stupidly they left the settlement without proper defences, and in AD 60 the famous British Queen Boadicaea or Boudicca rebelled from her Norfolk base, and completely razed the temple here and the whole settlement, slaughtering, we are told, 30,000 people. She did the same sort of thing at London and at Verulamium (St Albans). But soon she herself was defeated, and the Colonia was restored. Proper walls were built - walls you can still see today, along with one of its fine gateways. The Romans also built a fine theatre within the town walls. And that is where St Helen's Chapel comes into the story. The Christian Faith must have come to Colchester early. The Greek Menaion tells us that St Simon Zelotes of the Twelve and St Aristobulus of the Seventy both preached and died as Martyrs in Britain. It is a reasonable assumption that they came to the capital of the province, but if so they left no record of any visit. The earliest evidence for Christianity here is that the Bishop of Colchester attended the Council of Arles in AD 314 (though it must be admitted that certain other British towns claim that that Bishop was theirs). About the same time, between AD 320 and 340, a church was built, and you can see the remains, uncovered in recent years. Very likely there are remains of early Roman-British churches also below others of the town's churches. But less than a hundred years later, early in the fifth century, the Roman legions left Britain as the western Empire began to collapse, and Roman-British Colchester started to fall slowly into ruin. The pagan English (as opposed to British)races from mainland Europe (mainly Saxons and Angles) settled here, and the Christian Roman-British were either forced back into the more mountainous and remote parts of the island, or were subjugated to the immigrants. It was not until the seventh and eighth centuries that these English newcomers were converted. In this area they formed the kingdom of the East Saxons [= Essex], and this tribe was converted in the mid-seventh century. Possibly in the eighth century the English King Offa of Mercia (the midlands of England), who was overlord of Essex, and by then a Christian, came to Colchester, and built the small St Helen's Chapel within the ruined walls of the Roman theatre. Certainly the Chapel is on the Roman first century foundations of the theatre, which can be seen just above ground level: probably the core of the lower part of the walls of the Chapel is Roman too. At all events, when the Normans, after their conquest of the English in 1066, decided to build a castle here, to keep the Saxons quiet, and to defend against marauding Danes. They did this in 1076, on the foundations of the ruined Roman Temple of Claudius. At the same time, 1076, we know they restored St Helen's Chapel. This clearly indicates that the Chapel was very old by then, needing considerable repair. The Chapel seems never to have been a parish church as such, but was meant to minister to the needs of those who lived in the "demesne" of the lord, the land belonging to the Castle. Early in the fourteenth century a local Priest, John of Colchester, founded a chantry in the Chapel, and an almshouse was attached. Two other small chantries were added over the years. It was because of the chantries that in 1539 King Henry VIII had the Chapel closed, its income alienated. Then begins an unhappy period in the Chapel's history. It became a house, a school, a library, a Quaker meeting-house, a warehouse or workshop. Doorways and windows were blocked, others opened, including a large garage-like door in the east wall. A floor was inserted, to make it a two-storey building. But in the 1880s the Round family, who owned the Castle, generously bought the Chapel and restored it, employing the famous architect William Butterfield. He preserved all he could, and really did a good job - though, while the outside retains a definite charm, the inside feels very 'restored'. The Rounds presented it to the local Anglican diocese for use as a clergy meeting-room, but after a few years it became the parish hall for the local Anglican church. Such it remained until the 1950s, when it began to be used by the Castle museum as a storeroom, a situation lasting until 2000, with the interior of the Chapel entirely locked away from public view. So we come to the last chapter of the story for the moment. 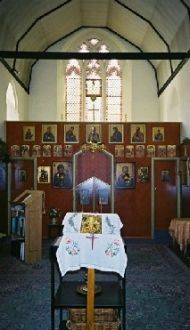 The Orthodox Parish of St Helen had been established in 1996, and had been looking for its own premises ever since. The Borough Council, fully sympathizing with the Parish's need and perhaps rather shameful of keeping such a building from the public, agreed to release it to the Parish for a period of two years, which can be extended to four. This took effect in November 2000. The building remains in the ownership of the local Church of England diocese, which happily gave its consent to the arrangement. Our Parish is intensely grateful to all those who have made it possible for us to have this ancient and lovely church. We are very aware of the privilege we have in using it. We are delighted that we have able to restore it to its ancient and proper purpose of Christian worship after a break of nearly 500 years - and, from the Orthodox point of view, to restore it to Orthodox worship after a period of nearly 1000 years!